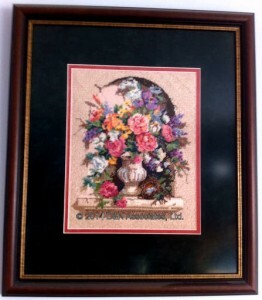 Included in this 1997 Dimension kit was: 12 count mesh canvas with full printed on color design, Persian wool, acrylic yarns, cotton floss, needle, and easy to follow chart and instructions ~ Everything you need to complete this Needlepoint project! The finished size is 12 x 16 inches. I did another needlepoint called Windswept, when finished I realized using a scroll bar style frame had allowed me to skew the piece such that I could not square it for framing. 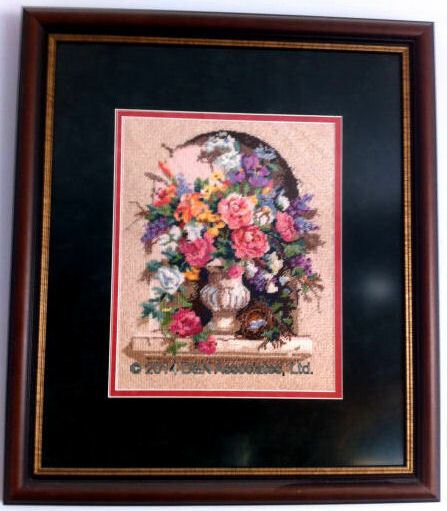 I like the tulips and greenery in Windswept such that I purchased another kit, near ten years ago and still have not gotten back to stitching my second needlepoint.